CSS transforms allows elements styled with CSS to be transformed in two-dimensional or three-dimensional space. This specification is the convergence of the CSS 2D transforms, CSS 3D transforms and SVG transforms specifications. This First Public Working Draft specification merges the former CSS 2D Transforms and CSS 3D Transforms specifications, and will also merge CSS Transforms and SVG Transforms. The merge is in progress and the specification is not yet ready for review. This document was jointly produced by the CSS Working Group (part of the Style Activity) and the SVG Working Group (part of the Graphics Activity). This document was produced by groups operating under the 5 February 2004 W3C Patent Policy. W3C maintains public lists of any CSS patent disclosures and public lists of any SVG patent disclosures made in connection with the deliverables of these groups; those pages also include instructions for disclosing a patent. An individual who has actual knowledge of a patent which the individual believes contains Essential Claim(s) must disclose the information in accordance with section 6 of the W3C Patent Policy. The list of changes made to this specification is available. The CSS visual formatting model describes a coordinate system within each element is positioned. Positions and sizes in this coordinate space can be thought of as being expressed in pixels, starting in the origin of point with positive values proceeding to the right and down. This coordinate space can be modified with the 'transform' property. Using transform, elements can be translated, rotated and scaled in two or three dimensional space. Additional properties make working with transforms easier, and allow the author to control how nested three-dimensional transforms interact. The 'transform-origin' property provides a convenient way to control the origin about which transforms on an element are applied. The 'perspective' property allows the author to make child elements with three-dimensional transforms appear as if they live in a common three-dimensional space. The 'perspective-origin' property provides control over the origin at which perspective is applied, effectively changing the location of the "vanishing point". The 'transform-style' property allows 3D-transformed elements and their 3D-transformed descendants to share a common three-dimensional space, allowing the construction of hierarchies of three-dimensional objects. The 'backface-visibility' property comes into play when an element is flipped around via three-dimensional transforms such that its reverse side is visible to the viewer. In some situations it is desirable to hide the element in this situation, which is possible using the value of ‘hidden’ for this property. Note that while some values of the 'transform' property allow an element to be transformed in a three-dimensional coordinate system, the elements themselves are not three-dimensional objects. Instead, they exist on a two-dimensional plane (a flat surface) and have no depth. There are two roles for transformations in layout: (1) transformations that adjust the position of the affected content without changing the normal layout of that content (much like relative positioning) and (2) transformation of the content prior to layout that affects the layout of that content. See http://lists.w3.org/Archives/Public/www-style/2007Oct/0209 for examples of both cases. The "transform" property (as defined in this document) is equally useful for both roles. This document is focused on satisfying the first role. There is, however, an architectural question that arises because there needs to be a way to distinguish which role an author of a stylesheet wants. The key question is which is the default behavior/role for the "transform" property and how is the other behavior/role indicated by a stylesheet author. If you have an opinion on this topic, please send feedback. What do fixed backgrounds do in transforms? They should probably ignore the transform completely, since - even transformed - the object should be acting as "porthole" through which the fixed background can be viewed in its original form. When used in this specification, terms have the meanings assigned in this section. A bounding box is the object bounding box for all SVG elements without an associated CSS layout box and the border box for all other elements. A transformable element in the HTML namespace which is either a block-level or atomic inline-level element, or an element in the SVG namespace (see [SVG11]) which has the attributes ‘transform’, ‘patternTransform’ or ‘gradientTransform’. A matrix computed from the values of the perspective and perspective-origin properties as described below. A matrix computed from the values of the transform and transform-origin properties as described below. A containing block hierarchy of one or more levels, instantiated by elements with a computed value for the transform-style property of preserve-3d, whose elements share a common three-dimensional coordinate system. Specifying a value other than ‘none’ for the 'transform' property establishes a new local coordinate system at the element that it is applied to. The mapping from where the element would have rendered into that local coordinate system is given by the element's transformation matrix. Transformations are cumulative. That is, elements establish their local coordinate system within the coordinate system of their parent. From the perspective of the user, an element effectively accumulates all the 'transform' properties of its ancestors as well as any local transform applied to it. The accumulation of these transforms defines a current transformation matrix (CTM) for the element. The coordinate space behaves as described in the coordinate system transformations section of the SVG 1.1 specification. This is a coordinate system with two axes: the X axis increases horizontally to the right; the Y axis increases vertically downwards. Three-dimensional transform functions extent this coordinate space into three dimensions, adding a Z axis perpendicular to the plane of the screen, that increases towards the viewer. Start with the identity matrix. Transforms apply to transformable elements. This transform moves the element by 100 pixels in both the X and Y directions. This transform moves the element by 80 pixels in both the X and Y directions, then scales the element by 150%, then rotates it 45° clockwise about the Z axis. Note that the scale and rotation operate about the center of the element, since the element has the default transform-origin of 50% 50%. In the HTML namespace, the transform property does not affect the flow of the content surrounding the transformed element. However, the extent of the overflow area takes into account transformed elements. This behavior is similar to what happens when elements are offset via relative positioning. Therefore, if the value of the 'overflow' property is 'scroll' or 'auto', scrollbars will appear as needed to see content that is transformed outside the visible area. In the HTML namespace, any value other than ‘none’ for the transform results in the creation of both a stacking context and a containing block. The object acts as a containing block for fixed positioned descendants. Is this affect on position:fixed necessary? If so, need to go into more detail here about why fixed positioned objects should do this, i.e., that it's much harder to implement otherwise. Normally, elements render as flat planes, and are rendered into the same plane as their containing block. Often this is the plane shared by the rest of the page. Two-dimensional transform functions can alter the appearance of an element, but that element is still rendered into the same plane as its containing block. Three-dimensional transforms can result in transformation matrices with a non-zero Z component, potentially lifting them off the plane of their containing block. Because of this, elements with three-dimensional transformations could potentially render in an front-to-back order that different from the normal CSS rendering order, and intersect with each other. Whether they do so depends on whether the element is a member of a 3D rendering context, as described below. This description does not exactly match what WebKit implements. Perhaps it should be changed to match current implementations? This example shows the effect of three-dimensional transform applied to an element. The transform is a 50° rotation about the vertical, Y axis. Note how this makes the blue box appear narrower, but not three-dimensional. The perspective and perspective-origin properties can be used to add a feeling of depth to a scene by making elements higher on the Z axis (closer to the viewer) appear larger, and those futher away to appear smaller. This example shows how perspective can be used to cause three-dimensional transforms to appear more realistic. The inner element has the same transform as in the previous example, but its rendering is now influenced by the perspective property on its parent element. Perspective causes vertices that have positive Z coordinates (closer to the viewer) to be scaled up in X and Y, and those futher away (negative Z coordinates) to be scaled down, giving an appearance of depth. An element with a three-dimensional transform that is not contained in a 3D rendering context renders with the appropriate transform applied, but does not intersect with any other elements. The three-dimensional transform in this case can be considered just as a painting effect, like two-dimensional transforms. Similarly, the transform does not affect painting order. For example, a transform with a positive Z translation may make an element look larger, but does not cause that element to render in front of elements with no translation in Z. An element with a three-dimensional transform that is contained in a 3D rendering context can visibly interact with other elements in that same 3D rendering context; the set of elements participating in the same 3D rendering context may obscure each other or intersect, based on their computed transforms. They are rendered as if they are all siblings, positioned in a common 3D coordinate space. The position of each element in that three-dimensional space is determined by accumulating the transformation matrices up from the element that establishes the 3D rendering context through each element that is a containing block for the given element, as described below. This exmaple shows how nested 3D transforms are rendered in the absence of transform-style: preserve-3d. 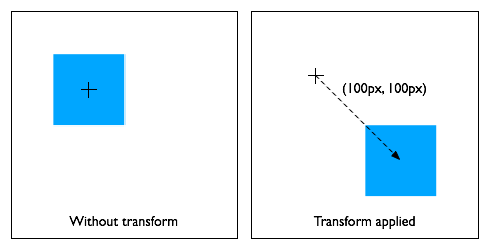 The blue div is transformed as in the previous example, with its rendering influenced by the perspective on its parent element. The lime element also has a 3D transform, which is a rotation about the X axis (anchored at the top, by virtue of the transform-origin). 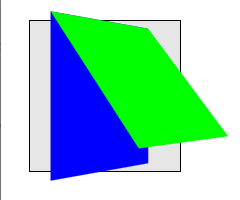 However, the lime element is being rendered into the plane of its parent because it is not a member of a 3D rendering context; the parent is "flattening". 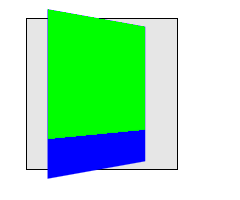 A 3D rendering context is established by a a transformable element whose computed value for transform-style is 'preserve-3d', and which itself is not part of a 3D rendering context. Note that such an element is always a containing block. An element that establishes a 3D rendering context also participates in that context. An element whose computed value for transform-style is 'preserve-3d', and which itself participates in a 3D rendering context, extends that 3D rendering context rather than establishing a new one. An element participates in a 3D rendering context if its containing block establishes or extends a 3D rendering context. multiply the accumulated matrix with the perspective matrix on the element's containing block (if any). That contining block is not necessarily a member of the 3D rendering context. apply to the accumulated matrix a translation equivalent to the horizontal and vertical offset of the element relative to its containing block as specified by the CSS visual formatting model. multiply the accumulated matrix with the transformation matrix. This example is identical to the previous example, with the addition of transform-style: preserve-3d on the blue element. The blue element now establishes a 3D rendering context, of which the lime element is a member. Now both blue and lime elements share a common three-dimensional space, so the lime element renders as tilting out from its parent, influenced by the perspective on the container. Should intersection behavior be normative? Elements in the same 3D rendering context may intersect with eachother. User agents should subdivide the planes of intersecting elements as described by Newell's algorithm to render intersection. Untransformed elements in a 3D rendering context render on the Z=0 plane, yet may still intersect with transformed elements. Within a 3D rendering context, the rendering order of non-intersecting elements is based on their position on the Z axis after the application of the accumulated transform. Elements at the same Z position render in stacking context order. This example shows show elements in a 3D rendering context can intersect. The container element establishes a 3D rendering context for itself and its two children. The children intersect with eachother, and the orange element also intersects with the container. Using three-dimensional transforms, it's possible to transform an element such that its reverse side is towards the viewer. 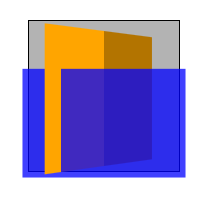 3D-tranformed elements show the same content on both sides, so the reverse side looks like a mirror-image of the front side (as if the element were painted onto a sheet of glass). Normally, elements whose reverse side is towards the viewer remain visible. However, the 'backface-visibility' property allows the author to make an element invisible when its reverse side is towards the viewer. This behavior is "live"; if an element with backface-visibility: hidden were animating, such that its front and reverse sides were alternately visible, then it would only be visible when the front side were towards the viewer. A transformation is applied to the coordinate system an element renders in through the 'transform' property. This property contains a list of transform functions. The final transformation value for a coordinate system is obtained by converting each function in the list to its corresponding matrix like defined in Mathematical Description of Transformation Functions, then multiplying the matrices. We need to resolve whether the computed value is the same as the specified value, or matrix(). The computed value of the transform property is a matrix() or matrix3d() value that describes the matrix that results from concatenating the individual transform functions. If the resulting matrix can be represented as a two-dimensional matrix with no loss of information, then a matrix() value is returned, otherwise a matrix3d() value. For elements with no transform applied, the computed value is ‘none’. Any value other than ‘none’ for the transform results in the creation of both a stacking context and a containing block. The object acts as a containing block for fixed positioned descendants. The SVG 1.1 specification did not specify the ‘transform’ attribute as a presentation attribute. In order to improve the integration of SVG and HTML, this specification makes the SVG ‘transform’ attribute a ‘presentation attribute’ and makes the ‘transform’ property one that applies to SVG elements. Since the SVG attribute becomes a presentation attribute, its participation to the CSS cascade is determined by the specificity of presentation attributes, as explained in the SVG specification. The SVG specification defines a DOM interface to access the animated and base value of the SVG transform attribute. To ensure backwards compatibility, this API should still be supported by user agents. The baseVal should be the value of the ‘transform’ attribute, as set on the element, and the animVal should be the property's computed value which account for CSS animation, if any is underway. Is this proposal working for SMIL animation of the transform property? The values of the 'transform' and 'transform-origin' properties are used to compute the transformation matrix, as described above. If only one value is specified, the second value is assumed to be ‘center’. If two values are given and at least one value is not a keyword, then the first value represents the horizontal position (or offset) and the second represents the vertical position (or offset). 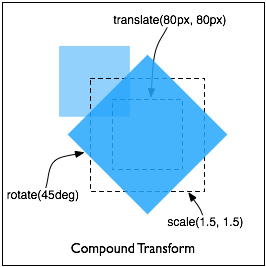 <percentage> and <length> values here represent an offset of the transform origin from the top left corner of the element's bounding box. For SVG elements without an associated CSS layout box the <length> values represent an offset from the point of origin of the element's local coordinate space. If three or four values are given, then each <percentage> or<length> represents an offset and must be preceded by a keyword, which specifies from which edge of the bounding box the offset is given. 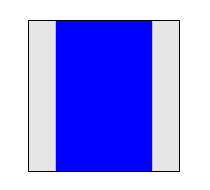 For example, ‘transform-origin: bottom 10px right 20px’ represents a ‘10px’ vertical offset up from the bottom edge and a ‘20px’ horizontal offset leftward from the right edge. If three values are given, the missing offset is assumed to be zero. Positive values represent an offset inward from the edge of the bounding box. Negative values represent an offset outward from the edge of the bounding box. Need to add 3D transform-origin variant in a way that is not ambiguous with the background-origin syntax (bug 15432). Computed value: Same as specified value. A value of preserve-3d for transform-style establishes a stacking context. overflow: any value other than ‘visible’. opacity: any value other than 1.
filter: any value other than ‘none’. Should this affect the computed value of transform-style? If the value is 'none', less than or equal to 0 no perspective transform is applied. The use of this property with any value other than ‘none’ establishes a stacking context. It also establishes a containing block (somewhat similar to position:relative), just like the ‘transform’ property does. The values of the perspective and perspective-origin properties are used to compute the perspective matrix, as described above. The 'perspective-origin' property establishes the origin for the perspective property. It effectively sets the X and Y position at which the viewer appears to be looking at the children of the element. The 'backface-visibility' property determines whether or not the "back" side of a transformed element is visible when facing the viewer. With an identity transform, the front side of an element faces the viewer. Applying a rotation about Y of 180 degrees (for instance) would cause the back side of the element to face the viewer. This property is useful when you place two elements back-to-back, as you would to create a playing card. Without this property, the front and back elements could switch places at times during an animation to flip the card. 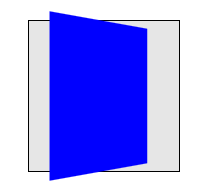 Another example is creating a box out of 6 elements, but where you want to see the inside faces of the box. This is useful when creating the backdrop for a 3 dimensional stage. Compute a matrix representing the accumulated transform from the viewport, taking the translations due to the CSS visual formatting mode, the perpsective and transformation matrices into account, in a similar manner to the computation of the accumulated transform for an element in a 3D rendering context. If the component of the matrix in row 3, column 3 is negative, then the element should be hidden, otherwise it is visible. Is the relevant matrix here really relative to the viewport, or to the root of the 3D rendering context? The value of the transform property is a list of <transform-functions> applied in the order provided. The individual transform functions are separated by whitespace. The set of allowed transform functions is given below. In this list the type <translation-value> is defined as a <length> or <percentage> value, and the <angle> type is defined by CSS Values and Units. Wherever <angle> is used in this specification, a <number> that is equal to zero is also allowed, which is treated the same as an angle of zero degrees. specifies a 2D transformation in the form of a transformation matrix of the six values a-f.
specifies a 2D translation by the vector [tx, ty], where tx is the first translation-value parameter and ty is the optional second translation-value parameter. If <ty> is not provided, ty has zero as a value. specifies a translation by the given amount in the X direction. specifies a translation by the given amount in the Y direction. specifies a 2D scale operation by the [sx,sy] scaling vector described by the 2 parameters. If the second parameter is not provided, it is takes a value equal to the first. For example, scale(1, 1) would leave an element unchanged, while scale(2, 2) would cause it to appear twice as long in both the X and Y axes, or four times its typical geometric size. specifies a 2D scale operation using the [sx,1] scaling vector, where sx is given as the parameter. specifies a 2D scale operation using the [1,sy] scaling vector, where sy is given as the parameter. specifies a 2D rotation by the angle specified in the parameter about the origin of the element, as defined by the transform-origin property, or a given point as to the origin of the element. For example, rotate(90deg) would cause elements to appear rotated one-quarter of a turn in the clockwise direction. With rotate(90deg, 100px, 100px) the element appears rotated after a translation of 100px in the vertical and horizontal direction. The actual origin of the element is not affected. specifies a 2D skew by [ax,ay] for X and Y. If the second parameter is not provided, it is has a zero value. specifies a 2D skew transformation along the X axis by the given angle. The skew vector is [ax,0]. specifies a 2D skew transformation along the Y axis by the given angle. The skew vector is [0,ay]. specifies a 3D transformation as a 4x4 homogeneous matrix of 16 values in column-major order. specifies a 3D translation by the vector [tx,ty,tz], with tx, ty and tz being the first, second and third translation-value parameters respectively. specifies a 3D translation by the vector [0,0,tz] with the given amount in the Z direction. specifies a 3D scale operation by the [sx,sy,sz] scaling vector described by the 3 parameters. specifies a 3D scale operation using the [1,1,sz] scaling vector, where sz is given as the parameter. Clarify "clockwise". Describe in terms of right-hand rule? specifies a clockwise 3D rotation by the angle specified in last parameter about the [x,y,z] direction vector described by the first 3 parameters. If the direction vector is not of unit length, it will be normalized. A direction vector that cannot be normalized, such as [0,0,0], will cause the rotation to not be applied. specifies a clockwise 3D rotation by the given angle about the X axis. specifies a clockwise 3D rotation by the given angle about the Y axis. specifies a clockwise 3D rotation by the given angle about the Z axis. This is a synonym for rotate(<angle>). specifies a perspective projection matrix. This matrix scales points in X and Y based on their Z value, scaling points with positive Z values away from the origin, and those with negative Z values towards the origin. Points on the z=0 plane are unchanged. The depth, given as the parameter to the function, represents the distance of the z=0 plane from the viewer. Lower values give a more flattened pyramid and therefore a more pronounced perspective effect. For example, a value of 1000px gives a moderate amount of foreshortening and a value of 200px gives an extreme amount. The value for depth must be greater than zero, otherwise the function is invalid. That is, in the absence of other styling that affects position and dimensions, a nested set of transforms is equivalent to a single list of transform functions, applied from the outside in. The resulting transform is the matrix multiplication of the list of transforms. When animating or transitioning the value of a transform property the rules described below are applied. The ‘from’ transform is the transform at the start of the transition or current keyframe. The ‘end’ transform is the transform at the end of the transition or current keyframe. the individual components of the function are interpolated numerically. the values are first converted to a 4x4 matrix, then decomposed using the method described by unmatrix into separate translation, scale, rotation, skew and perspective matrices, then each decomposed matrix is interpolated numerically, and finally combined in order to produce a resulting 4x4 matrix. The ‘none’ is replaced by an equivalent identity function list for the corresponding transform function list. For example, if the ‘from’ transform is "scale(2)" and the ‘to’ transform is "none" then the value "scale(1)" will be used as the ‘to’ value, and animation will proceed using the rule above. Similarly, if the ‘from’ transform is "none" and the ‘to’ transform is "scale(2) rotate(50deg)" then the animation will execute as if the ‘from’ value is "scale(1) rotate(0)". The identity functions are translate(0), translate3d(0, 0, 0), translateX(0), translateY(0), translateZ(0), scale(1), scale3d(1, 1, 1), scaleX(1), scaleY(1), scaleZ(1), rotate(0), rotate3d(1, 1, 1, 0), rotateX(0), rotateY(0), rotateZ(0), skew(0), skewX(0), skewY(0), matrix(1, 0, 0, 1, 0, 0) and matrix3d(1, 0, 0, 0, 0, 1, 0, 0, 0, 0, 1, 0, 0, 0, 0, 1). Each transform function is animated with its corresponding destination function in isolation using the rules described above. The individual values are then applied as a list to produce resulting transform value. The transform function lists are each converted into the equivalent matrix3d value and animation proceeds using the rule for a single function above. In some cases, an animation might cause a transformation matrix to be singular or non-invertible. For example, an animation in which scale moves from 1 to -1. At the time when the matrix is in such a state, the transformed element is not rendered. When interpolating between 2 matrices, each is decomposed into the corresponding translation, rotation, scale, skew and perspective values. Not all matrices can be accurately described by these values. Those that can't are decomposed into the most accurate representation possible, using the technique below. This technique is taken from the "unmatrix" method in "Graphics Gems II, edited by Jim Arvo". The pseudocode below works on a 4x4 homogeneous matrix. // an easy way to test for singularity of the upper 3x3 component. // rightHandSide is the right hand side of the equation. // rightHandSide by the inverse. // Compute X scale factor and normalize first row. // Compute XY shear factor and make 2nd row orthogonal to 1st. // Now, compute Y scale and normalize 2nd row. // Next, get Z scale and normalize 3rd row. // At this point, the matrix (in rows) is orthonormal. // is -1, then negate the matrix and the scaling factors. Once decomposed, each component of each returned value of the source matrix is linearly interpolated with the corresponding component of the destination matrix. For instance, the translate and translate values are interpolated numerically, and the result is used to set the translation of the animating element. A 2D translation with the parameters tx and ty is equivalent to a 3D translation where tz has zero as a value. A 2D scaling with the parameters sx and sy is equivalent to a 3D scale where sz has one as a value. A 2D rotation with the parameter alpha is equivalent to a rotation around the Z axis.